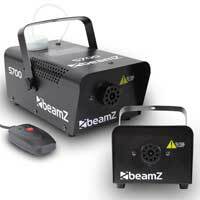 A package of two machines ready for use, the 700W smoke machines from Beamz are fog makers with compact design, delivering a misty serenity to your house parties, small events and venues alike. Ideally for use indoors and impressively filling smaller rooms or areas; these machines will generate voluminous mist clouds and elevate your house parties and get-togethers to the next level. The machines come with their tanks already filled for a single use (500ml in each machine), so if you've got more events creeping up (any spooky halloween parties planned this year?) then be sure to get supplied with more fluid! Two great units; well-designed and complete with wired remotes so fog emissions are controlled throughout the night.